Berkeley, CA â€“ 9 December 2011 â€“ “Save yourself. Stay in the woods. Pray it hasn’t reached the wolvesâ€¦ and keep your gun loaded.” All he knows about what has happened to the world as he knew it has been left in an ominous message. And it’s clear that everything has… changed. Image Comics and Shadowline are pleased to announce REBEL BLOOD, a new four-part miniseries coming in March with art and concept by Riley Rossmo (GREEN WAKE, COWBOY NINJA VIKING, PROOF) and script by newcomer Alex Link. This gruesome new 21st century zombie outbreak story pays tribute to horror comics’ post-war heyday of titles such as The Vault of Horror, The Haunt of Fear, and Tales From the Crypt, while presenting a concept to rival the best of The Twilight Zone! REBEL BLOOD #1 introduces Forest Ranger Chuck Neville, who, after a strange, unexpected silence, receives a final radio message that a plague is sweeping the country. He learns that the disease has turned every living creature into zombies, all at once rendering the entire animal kingdom unpredictable, violent, and willing to tear apart their neighbors with their bare teeth. 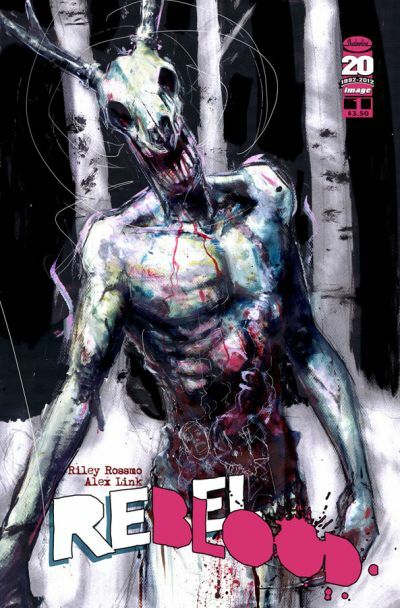 REBEL BLOOD #1, a 32-page full-color horror comic book for $3.50, will be on sale in stores on March 28 and available for order in the January issue of Previews. A preview of REBEL BLOOD #1 will be featured in the back of both HAUNT #20 (AUG110523), a 32-page full-color horror comic book for $2.99 that goes on sale December 28, 2011, and SPAWN #215 (NOV110468), a 32-page full-color horror comic book for $2.99 that goes on sale January 11, 2012.